Former CFL player and Dynavision founder Phil Jones discusses Dynavision and what it does with reaction training and concussion recovery, as well as what teams are using it right now. Flashes of light blink across Dynavision’s screen. Athletes must react immediately to see, process and then respond to those lights. It may prove a simple concept, but that’s how you train the brain, Phil Jones, former CFL player and Dynavision founder, tells SI.com. It can also be how you see if a brain has recovered from a concussion. As athletes—in its most basic setup—hit has many lights in one minute as possible, often with a varying degree of circumstances thrown at them—the machine tracks their reaction time in a score. Jones calls it high-performance reaction training. Will Shields, former Kansas City Chief and now owner of 68’s Inside Sports training facility, tells SI.com he brought in Dynavision originally to work on athlete’s hand-eye coordination and vision awareness, but it has built into a concussion-related tool. “We can use different tests to see what part of your brain has been concussed and how far along you are,” Shields says. Jones says players training on the device have a baseline score. A concussion can alter that score dramatically. A player hitting around 125 lights per minute would crash, he says, down to 60 or 70 following a concussion. They might even have difficulty looking at the lights. During a partnership with the University of Cincinnati’s football program, the team has seen a reduction from over eight concussions per year, Jones says, to just over one per year during the four years of Dynavision use. “We are looking at Dynavision as prevention, monitoring, diagnosis and long-term recovery,” Jones says. ​Can it train the brain? Jones says he started using vision training near the end of his career with the Edmonton Eskimos. “Seven years in, everything is the same,” he says. “You eat the same, lift the same, everything is the same.” He started vision training and felt his increased awareness, this feeling of “walking on my toes” allowed him to see the quarterback and receivers coming into the zone at the same time. “If you can see the ball coming off the quarterback’s hand, you have a better chance of making a play on the ball,” he says. His interceptions went up and he bought the device he was using from the group of optometrists using it in clinical settings. “They had no idea about athletics,” he says. As Shields trains young athletes, he throws a mixture of circumstances at them. With Dynavision he can track how well they react, even when bombarded with additional information. The device has six basic programs at installation, but as athletes get comfortable using Dynavision, trainers can add in sport-specific protocols. In football, Jones’ team has designed programs specific for receivers, linebackers and lineman. For example, the unit will rise to its highest position for a receiver, right at the decision-making point between reaching or jumping for a ball (or in this case, a light). Lineman may fire out of a stance and then quickly identify one of the 64 light positions and make a quick adjustment to reach it. When Jones started Dynavision it was basic, with no ability to save scores. Now fully computerized, it tracks scores and graphs results. He can also flash different things in the central area, from math equations to a program’s specific playbook. “It gives us the ability to have information coming at different speeds and sizes,” he says. 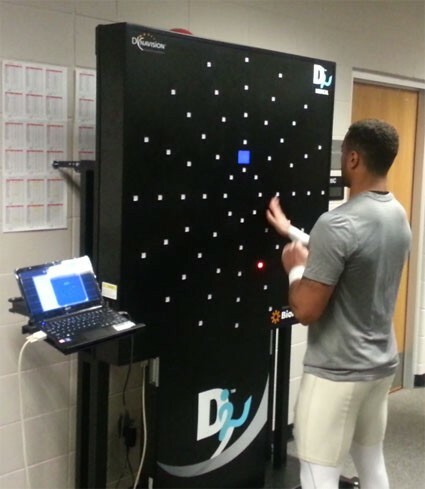 While in use in over 1,200 hospitals and clinics around the country and with athletes from football to hockey to clay shooting using the device, Dynavision also exists in IMG’s sports academy, the Mayo Clinic, four NBA teams (Spurs, Pacers, Celtics and Nets), three NFL teams and top NCAA programs, such as Duke and Ohio State. Training the brain to react has taken on new forms with Dynavision. Forms that flash.